The Scottish terrier is an ancient breed documented as a fearless fox hunter as early as the 1400s. Nicknamed "The Diehard" for his tenacious nature, the Scottish terrier originally was a working dog that routed rats, and tracked fox, badger and other small prey. Highly prized for his loyalty, intelligence and energy, the iconic Scottie left the fields and farms to become a companion to royalty and presidents. King James VI of Scotland loved the Scottish terrier, and his enthusiasm helped to popularize the breed during the 17th century, according to the book "Scottish Terriers." The only son of Mary, Queen of Scots, James ruled from 1567 to 1625, inheriting the English throne in 1603. During his reign, he sent six Scottish terriers to France as a gift. In the highland countryside of Scotland, the Scottie was known as a "digger," who would pursue prey with tenacious vigor. Country folk relied on Scotties to rid their farms and houses of vermin. Hunters used the alert and determined Scottish terrier for small game hunting. Scottish terriers also are known by other names, such as the Skye terrier or Aberdeen terrier, reflecting the area of Scotland they once inhabited. Scotties were introduced at the Birmingham, England dog show in 1860. In the following years, the breed's fans argued that the show allowed dogs to be categorized as Scottish terriers, when they actually were terriers of other types. By 1880, the breed was mostly standardized, and in 1882, the Scottish Terrier Club was formed in Britain. Scottish immigrant John Naylor is credited with importing the first Scotties to America in 1883. Two years later, the American Kennel Club registered its first Scottish terrier, a laddie named Prince Charlie. In 1900, U.S. Scottie fans founded the Scottish Terrier Club of America. Loyal pets, Scottish terriers tend to attach to a single person. This characteristic has made them perfect companions to occupants of the Oval Office. Three different Presidents have chosen Scotties to accompany them, making Scottish terriers the only breed to occupy the White House three times. The most famous White House Scottie is Fala, who was immortalized by President Franklin D. Roosevelt in a speech that became known as "The Fala Speech." Scotties also were faithful friends to Presidents Dwight D. Eisenhower and George W. Bush, according to The American Kennel Club. 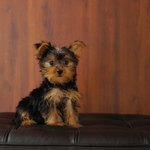 What Would Cause Shaking in Yorkies?